The France Coqs have broken through for their first-ever 18-a-side international victory, defeating the East Timor Crocs by 109 points in the cold and wet at Blacktown International Sportspark today. In a game which failed to reach great heights, the Coqs' relentless grind and better ability in the wet saw them grow a lead throughout the game, winning every quarter with captain Théis leading the way from the midfield. The first quarter saw France start strongly, kicking two goals early in the match, before the Crocs kicked their first ever goal in IC-grade international footy. With neither team able to achieve any further majors before quarter time, both went into the first break with plenty of anticipation of a tough contest. India took on China today at Holroyd Oval, Gipps Road Sports Complex, at 12pm on Wednesday 17th August. In light rain the game started with India getting on the scoreboard first kicking 2.2 to China's 1.4 in the first quarter. Both sides went hard at the ball, but India's small men were able to link up with chains of handball and come out in front. Jay Himat (#7) and Vishnu Rishe (#17) were the goalkickers for the Tigers while Zhou Min (#10) scored China's only major, inaccurate kicking hurting their cause. India's Rakesh Ghosh (#4) looked dangerous around the packs, while Ayush Gupta (#24) won many contests. Keeping track of the players was proving hard with quite a few changes to jumper numbers for the Indian squad. Update Wed 8pm AEST: Good news as Indian player Merv Nathaniel has been given the all clear and left hospital after full brain and spinal scans. Update Thursday: Chinese play Lu Hao was also injured and underwent surgery for a broken ankle. There was also a suspected AC (Timor Leste) and a broken jaw (Tonga) earlier in the tournament - there will always be injuries and the players are going hard at it, but there seems to be an unlucky run at the moment. As is becoming traditional at International Cups, the Australian Football League held an International Development Forum with the attending nations. In 2008 there was some vision from the AFL and brainstorming sessions with the country representatives. This time around the AFL revealed ambitious plans for the growth of the game. Nauru went into this match strong favourites after dominating their group on Game Day 1. The extra years of experience and the match hardening of footy in country Victoria meaning that the polish of Nauru should hold sway over the enthusiastic fast developing Tongans. 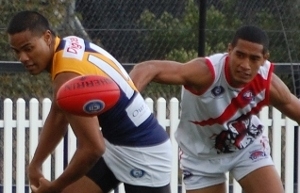 The Tongans have had some of their own local footy experience though in recent weeks with Campbelltown in the NSWAFL competition. Perhaps surprisingly Tonga showed they've already improved in this competition, and pushed Nauru all the way. Ultimately it was the superior marking power of the Chiefs that kept the Tigers at bay. It was noticeable in the Tonga vs PNG match on the opening day that the Tongans tended to rush the ball in the air and find themselves running underneath it - a sign of inexperiences and over enthusiasm. If they can improve in that area they will push all the middle ranked sides. Full report has now been added below. In the last match of Game Day 2 (Monday 15th), in a trans-Atlantic challenge the Great Britain Bulldogs took on the Canadian Northwind. Going on past ranking the Canadians would have gone in favourites today but Great Britain showed that the squad they have brought in 2011 is perhaps the most balanced one yet in terms of height, speed and strength. They took out today's match by 29 points. After the first five minutes of bouncing to and fro from pack to pack the Canadians were the first to get on the board, even if only with a behind. The ping pong nature of the game continued with many stoppages and turnovers forced by intense pressure from both sides. Great Britain finally broke the deadlock with a goal to Tom Mercer. Late in the quarter Gareth Blackstaffe-Turner for GB was hurt (possibly broken/dislocated finger) when he barreled over the metal faux picket fence. While this incident was assessed and Blackstaffe-Turner lay on the ground outside the field of play (like a WWE wrestler cast from the ring) play was stopped and due to no time on in the quarters the siren sounded. A Canadian free kick after the siren from 70m out failed to make the distance and it looked like the team that settled to get clear possessions would eventually win the match. Scores will be updated every quarter throughout the day. We suggest you refresh your browser regularly to see the latest. Match reports will follow later in the day and into Thursday. Please note that we are very stretched with simultaneous games all over Sydney so may not have full match reports for all games. Also note the matches at Holroyd are running late due to some injury delays. The future of footy is bright. It might also be international, multicultural and female. At the second day of the International Cup at Blacktown International Sportspark, AFL Game Development Manager David Matthews remarked that now there were 70,000 footy players around the world, and that the next International Cup, IC14, might have 30 teams, rather than the 18 men’s and five women’s teams at IC11. AFL Commissioner Sam Mostyn, speaking at the official launch of the Women’s International Cup was also confident about the international future, expressing her aspiration that ‘the fifth International Cup will double the number of women’s teams here’. After afternoon of football, the players of the IC11 Women’s Division were invited to the Women’s Launch in the function room overlooking Oval 1. Against a backdrop of the USA Revolution playing against the Japanese Samurai in the men’s division, the women gathered together, many meeting each other for the first time, some with jubilant faces from a hard fought win, others reflective of experiences gained and lessons learnt on the history making opening day of the first ever Women’s International Cup. After the Canadian Northern Lights and their opponents, the triumphant Irish Banshees, had joined the group, fresh from an exciting game of two of women’s football’s top teams, the launch function began with an introduction from the Indigenous leader of western Sydney, welcoming the teams to their country and lands, and wishing them all the best for both their stay in Sydney and their hopes for the International Cup. The US put on a power display at BISS Oval#1 last night against Japan, sending out a warning message to the South Africans that they will be coming at them on Sunday at ANZ stadium with the pace they were lacking in IC08. The US were out of the blocks early with a breeze behind them with a goal to Jesse Leos and shortly later Andy Vanica. The US continued to pump the ball in and the Samurai particularly Ono and Kuno tried hard to keep them out. The US gave away a number of free kicks that stopped them from adding more goals, but the warning signs were there. A mix of bright sunshine and clouds greated the Canadian and Irish women as they took to Blacktown's number one footy oval for their first ever meeting and just the second women's match ever in the International Cup. The Irish Banshees came onto the field as favourites but the Canadian Northern Lights were determined to make an impact in their first game. Both teams were evenly matched for height and build, just the Irish, with many players based in the Sydney Women's AFL teams, leading by experience. The game was fought out mostly in midfield in the first half, with neither team managing to dent the strong defence of the others, but Ireland managed to squeeze through, taking the first goal. But the Canadians came back, cheered on by the men’s team on the sidelines, and managed to claw back to 6 all before quarter time. After two days of matches, 24 games so far, only one entrant has scored the perfect 24/24 so far - congratulations to Derryn. But with that success comes the pressure of the chasing pack. Be sure to get your tips in for Game Days 3 and 4 before Wednesday morning. Note that if no tips are received you get the worst of the submitted tipsters for that round.